PShutDown is an open source tool that allows users to schedule various computer related tasks like rebooting, logging off, run programs, run alarms and go to sleep. 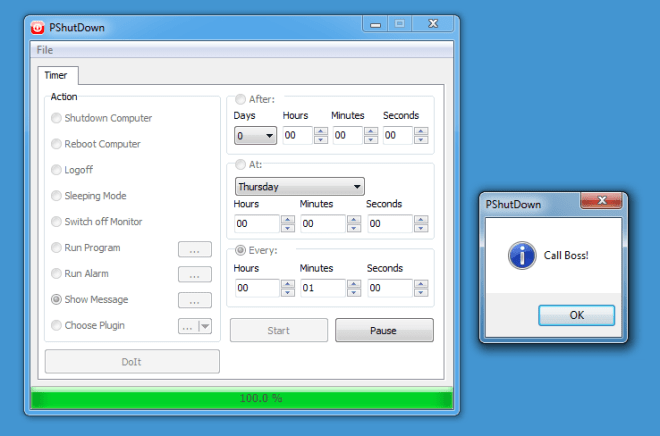 PShutDown is an open source tool that allows users to schedule various computer related tasks. For example, you may have to head home from the office while you have a download running on your system, which might mean leaving the system on overnight. Doing this will obviously result in the consumption of unnecessary electricity and might cause any problems in case of an unexpected power surge (when you are not around). To avoid this issue you can use PShutDown to schedule a shutdown time for your system. This can be scheduled as the approximate time after which you expect the download to complete. You can also schedule your computer to reboot, display reminders, switch off the monitor, log off the system, run an alarm, etc. Once you have selected a task (like a reboot), select the time frame and click on Start. This will kick off a countdown bar at the bottom of the application. When the progress reaches 100%, the scheduled job will be initiated. If you need stop the countdown all you have to do is click ‘Pause’. Any selected job (like a log off), can also be instantly performed by clicking on the ‘Do It’ button. 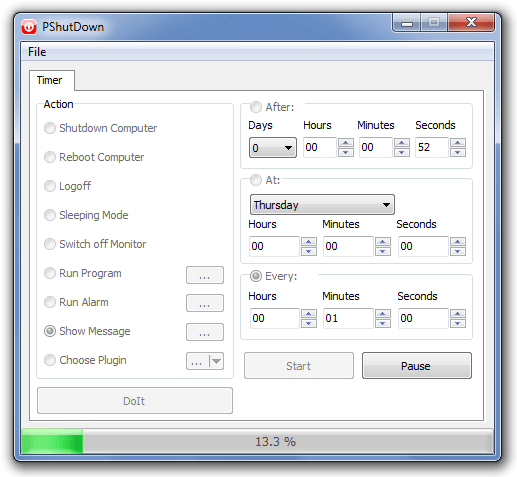 PShutdown currently supports a total of 9 Actions, which are, Shutdown Computer, Reboot Computer, Log Off, Sleep, Switch Off Monitor, Run Program, Run Alarm, Show Message, and Choose Plugin. PShutdown is a free program for Windows 7 only. Give a try!